The new Dining Hall was relocated on the second level of a former Sears space, directly below the future Nordstrom location. Emulating its new fashion neighbor above, the dining hall has a decidedly fashion look. The seating capacity was increased from 500 to 850 guests and includes a state-of-the-art scullery, thereby reducing the dining halls environmental footprint. The objective was to create a dynamic and contemporary food destination, elevating the experience from food court to stylish dining hall, while maintaining a strong connection with local Ottawans by referencing familiar geography and national buildings. 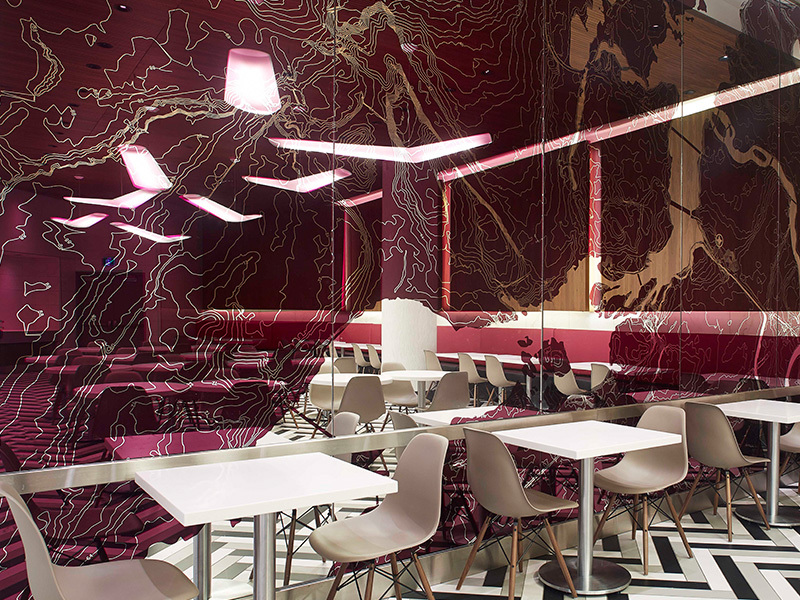 The pattern of the pink etched glass wall mirror in the side seating zone is a topographical map of Ottawa.